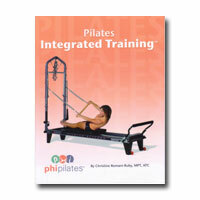 Description : This 50 page manual provides instruction and digital photos of the innovative integrated Pilates exercises developed by Chrissy Ruby. These exercises are performed on the reformer half trap with the reformer carriage in motion. Description : This 50 page manual provides instruction and digital photos of the innovative integrated Pilates exercises developed by Chrissy Ruby PT, MPT, ATC, PMA® CPT. These exercises are performed on the reformer half trap with the reformer carriage in motion.